Discussion in 'Grooming & General Cat Care' started by brandy-neka, Nov 13, 2011. Now the reason why I'm posting this. I've decided to take the liners out all together and just use her litter box and litter, the box is very smooth so it should be fine on her paws and hopefully not having the lining in there won't make her have accidents or anything. I have clumping litter and usually scoop it daily, if I can't get to it one day for some reason I always get to it the next. That is a normal domestic cat, your dear Savannah is not , and neither is mine. This is an example of PICA ISSUES, which is very common in the breed . That is a very good idea. I should probably have mentioned, that litter box liners and Savannahs seem to be a no no . At least in my humble experience. 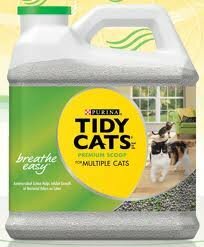 If the litter box liners where unscented and smooth, all should go well. If they where scented and had a different texture you might have a problem. I have never used bleach, so I am not sure what to say. But I can tell you this, NEVER EVER use anything with amonia in it. It can cause the cat to spray. I just use Fresh Step Pet Wipes (http://www.freshstep.com/products.php#). That might work, not sure. Just my , NEVER EVER USE CLUMPING LITTER WITH THIS BREED OF CAT! The breed has the PICA problem, not just your cat. I sure hope the breeder explained that. Please note, my answers are in bold face type. I use Dawn dish washing detergent to wash all my cats' things. Clumping clay litter can be dangerous for kittens, if that is what you are using. Especially with a kitten inclined to eat things she shouldn't. It expands 10 times or more it's dry volume when wet, and can cause blockages. I have two sets of litter boxes, so while one set is in use, the other set is being washed and aired. The next morning they are scrubbed and rinsed..first with hot water, then cold water to remove soap residue, then with white vinegar to remove any lingering odors or soap residue, then a final cold water rinse. I scrub the boxes in the bathtub with dish soap and an old sponge, rinse, then pour enough white vinegar to cover the bottom and let it sit for 10 minutes, then a quick swish with the dish soap sponge again and rinse well. You probably don't have to do the vinegar thing every time, but since I'm cleaning so many boxes at once it works for me. You can also use properly diluted bleach mixture for the soak, but it's not actually a cleaner (just a disinfectant) so the box should be cleaned somehow before bleaching. 1. Smart Scoop No-Stick Litter Box Spray. With a clean litter pan, I spray the bottom and sides, as well as the litter pan cleaning tools. Let dry then add the litter. It helps to keep things from sticking, should they make it through the litter to the bottom...or on the sides. 2. A metal paint scraper with the wide blade. This is the best tool for helping to really get the box clean. First I use the blade around the sides, much like one would do to loosen a cake in the pan. Then I scrape along the bottom...it really gets everything away from the bottom and sides, making it easier to scoop up. I do use clumping litter, so that is what my experience is based on. Also, I'm a firm believer in scooping the litter pan twice a day. The way I look at it...I'd hate to find that my own toilet was only flushed once a day...so I won't ask any less of my cat. In fact, if I know that she has gone in and had a BM, I head in, make sure it's covered and go on and scoop it out. We use plain Dawn dish soap to clean the boxes. I use an old wash cloth to clean them. I also have 2 sets of boxes so that I can have a set to use while one set is being cleaned. We replace the boxes about once a year since the plastic ones can scratch and hold in odors. I also believe in scooping twice daily to help control odors. We use World's Best Cat Litter and love it! We use Swheat Scoop Multicat litter in quasi-automatic Omega Paw rolling litterboxes (four of them for two cats) and when putting fresh litter in I spray the box lightly w/ PAM vegetable oil anti-stick spray to ensure there aren't any pee clumps that stick to the bottom. I don't like to scoop too often not just out of laziness, but the pee/poo clumps harden in the litter if allowed to sit a while which keeps the box clean when I roll it. We don't use liners either, Wesley would tear it to shreds as he sometimes likes to dig to China and besides he likes licking plastic too. I think those rolling boxes are a terrible invention. I can only imagine how much they must stink inside, being coated from top to bottom with pee and poop day after day. Ick. I use Jonny Cat Scooping Cat Litter. I scoop morning and night, and once more in the day if I'm home. I do similar to what Otto does. Only I soak the boxes over night in the tub with hot water and "Mr. Clean" or "Javex" (never mixed together). Then I run the toilet brush over them and rinse a few times with hot water and then turn the boxes upside down to dry. Then into the utility closet they go until the next litter change. I use a generic bleach cleaner and scrub brush... but in a bathtub? I'd never get it clean enough to take a bath in there again. To me that'd be like taking a sip out of a toilet, no matter how much you scrub... it wouldn't be enough mentally for me. When you live in an apartment, where do you suggest that the box be cleaned? Your choices are: Bath tub, bathroom sink, toilet or kitchen sink. Every apartment I've been to had water somewhere outside. Just flop it in the trunk and wash it when you wash your car. Yup, they are definitely unpopular and poorly reviewed for that reason. Oh wait, no they aren't. #1 Selling litterbox on Amazon.com with 4.5 out of 5* review, with the poor reviews complaining about plastic tabs breaking, not about "stink". And if your cat is somehow getting urine and feces on the top of the device, you really really need to bring them to the vet. Most cats pee in the litter, which creates solid hard clumps, and they poo there as well which harden from the moisture absorption of the litter unless your kitty is suffering from persistent loose stools which would be a real medical concern. When you roll the box, the pee and poop goes all over the box. That is what I meant by pee and poop all over the box. I'm sure the box is popular, many people are lazy and don't like to be bothered with cleaning litter boxes, and don't care if their cats have to smell horrid odors when they use the box. For myself and my cats, I prefer cleanliness rather than convenience. There are many many apartments with no "water outside". Including mine. In fact, I have never lived in an apartment that had an outside water source. I wash my litter boxes in the bathtub. We have one of those detachable shower heads that makes it easy to rinse. Seeing as how I don't drink out of my bathtub (and if I used it to hold water if our water was off, I'd boil it first) I have no problems using the tub or shower after I've cleaned the boxes. I usually clean boxes and then clean the bathtub when I'm finished. Since there's no measurable amount of litter, pee, or poop in my shower, it's no worse than washing dirty dishes in the sink. before I clean the dirty one, I fill the clean box with fresh litter so that they always have litter available. I use Dawn Dishwasing soap first and give the boxes a good scrub. Then in goes some bleach mixed with water and scrub some more. Then I rinse and rinse. Add the white vinegar and let sit for ten minutes. Rinse again and wipe dry. I have two set's of litter boxes as well. I like the suggestion of leaving baking soda sit in the bottom of the clean boxes till their next use. :bigthumb: I have a pretty large Utility sink that I wash the boxes in. I would never use or have never used the liners. They would get torn to shreds. I use Dawn Dishwasing soap first and give the boxes a good scrub. Then in goes some bleach mixed with water and scrub some more. Then I rinse and rinse. Add the white vinegar and let sit for ten minutes. Rinse again and wipe dry. I know what you said, I'm saying your guess is wrong. As an actual long-term owner, no pee or poop goes all over the box. I've corrected you on that statement before. If it did, it would surely show up at least once in the near hundred reviews from actual owners of the box. That WOULD happen if the cat doesn't pee/poo in the actual litter (which coats it and absorbs moisture) or had very loose stools, but that is a medical problem not a litterbox one IMO. That is what I meant. I read about 10 of the reviews and there were several mentions about odor, but not enough to deter the people writing the review from using them.